Hitting muddy and slippery tracks in your 4x4 might look great, but it can not only be dangerous but costly. Accredited 4x4 trainer and freelance journalist Steve Cassano speaks to REDARC about some of the do's and don't's that will make sure you still have fun and look after your vehicle for the long-term. It’s inevitable that when you’re out wheeling in your 4WD, you’ll come across a variety of conditions. One such condition is driving through mud. I’ll start by saying, for many adventurers, they find mud driving a lot of fun but it’s certainly not my favourite. That’s because of the detrimental long-term effects to a 4WD long after that of the excitement experienced, especially if you don’t regularly maintain your 4WD. There are several types of mud that you may experience in your travels. In this article, we'll focus on confronting muddy and slippery tracks and how to reach a successful outcome. Driving through mud, especially splashing through watery mud can make for impressive images but it’s risky to the vehicle’s components and your safety. I try to avoid mud as much as possible, especially deep sticky mud. When confronted with anything over axle depth, I always look for the higher points of the track or choose an alternative line as long as I keep to the main track to avoid any adverse impact to the environment. Remember that many of these tracks are used as access for local farmers and residents, so always respect the privilege of driving these roads. Like my 4WD and most modern-day 4WDs, you’ll need to realise that the undercarriage, driveline and suspension components are very vulnerable to debris, especially salt water, flinging stones and mud. These days the latest 4WDs seem to have caught up with their on-street cousins by having computers and a myriad of electronic sensors scattered throughout the vehicle to enhance performance, reliability and safety. They simply don’t like to be encrusted in mud, as mud has a corrosive and sandpaper-like characteristic over time. It seems to get in every nook and cranny, regardless of how sympathetically you seem to drive. If you really need to traverse muddy tracks, then I’d like to offer a few tips on how to prepare and negotiate this challenge successfully and share my ideas on what you can do to prevent any future problems. Like any track that is wet, preparation and caution is the key. 1. Ask yourself is it worth the risk? 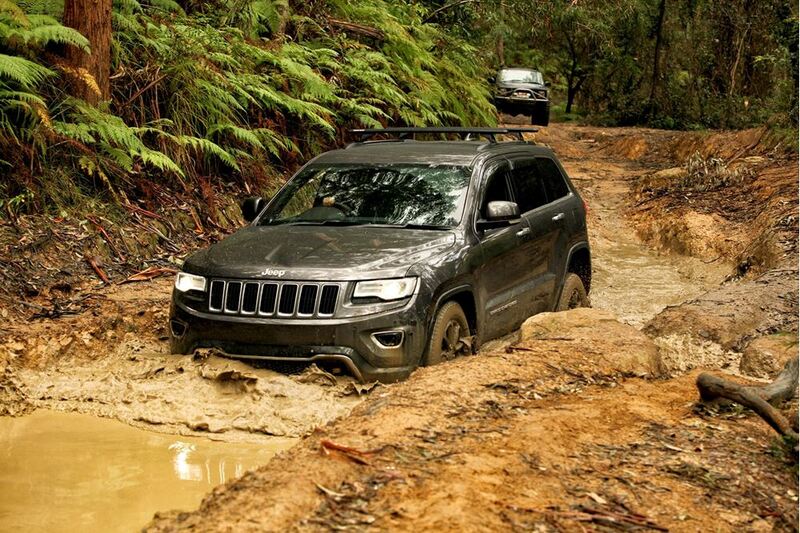 Depending on the nature of the mud type, steepness, vehicle’s traction qualities and your own abilities, ask yourself if going ahead is doable and safe. Next, walk the track looking for hidden obstacles or changes in track conditions including clearance that may vary along its path causing the 4WD to possibly lose momentum. Check the entry and especially the exit point. Lowering pressures changes the tyre’s characteristics, including increasing the tyre’s footprint and suppleness, thus improving traction and helping to accommodate variances on the surface. Unlike many other commentators on this subject, don’t think of lowering tyre pressures by individual PSI numbers but think of it as percentage changes. For example, I might drop pressures down by 50% from road pressures for mud. Have a strategy in-place if things don’t go to plan. This would certainly require having recovery equipment, like winches (check to see if it actually works), traction boards and rated straps along with rated shackles at the ready. It may even be advisable to have the straps already connected in the event of failure. Ensure they are long enough to reach sturdy mounting points along the path or even to another 4WD. Always adhere to proper and safe recovery techniques. For the most part, remain in existing wheel ruts (occasionally straddling a rut may be the better option but that’s a discretionary decision, depending on the terrain), as this will be the safest option and usually provides the better traction. No more so than when descending. Keeping to existing ruts acts like railway lines, which helps navigate away from errant trees and rocks that could make for a bad day if you hit any at speed. Select 4WD low range and lock the centre diff if applicable. Use the rear diff lock if equipped. For general steep hills, I select 2nd gear in my automatic to prevent gears swapping mid-way and possibly causing the 4WD to lose momentum. Avoid changing gears halfway in a manual. Drive along the track with steady throttle control and constant momentum and keep the nose pointing up-hill and never cross sideways as a rollover is likely. I find fast walking pace provides the best results but this can vary depending on conditions. On really slippery tracks, spinning of tyres may occur but this can be favourable as it expels mud that may be caught in the tread. Keep close to the track’s crown and avoid soft edges whilst also wiggling the steering wheel quickly left to right an eighth of a turn. I find this boosts the tyre’s sidewalls and tread blocks ability to grasp for extra grip. I suggest soon after completion, inspect under and around the 4WD looking for anything unusual. When you can, copiously hose in and around your wheels, paying particular attention around ABS and other sensors, which are prone to failure when abused by mud. I regularly take the time to remove the wheels allowing better access to brakes, suspension and driveline components for inspection and cleaning. If you’ve had mud come over the bonnet, don’t forget to clean what’s behind the grill. Some vehicles can have multiple radiators, intercoolers and other coolers positioned at the front. So plentiful water (not too strong) directed from behind the radiator assembly should expel any mud and debris. Finally, if you intend to do a lot of mud driving, then invest in a set of quality mud terrain tyres. As the name implies, muddies will give the best grip and traction on muddy tracks.